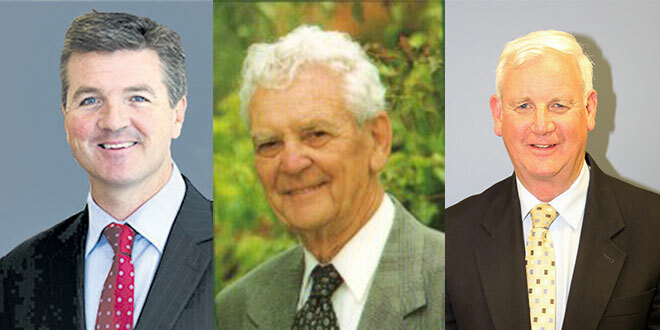 Birthday surprise: Geoff Rodgers, Mike Byrne and Lionel Veale are among the Queenslanders honoured in the Queen’s Birthday list. PROMINENT Catholics have been honoured in the 2016 Queen’s Birthday Honours list. They include Mike Byrne, appointed as a Member of the Order of Australia for significant service to Catholic education as an administrator, to policy development and reform, and to professional standards. “It’s wonderful to see Mike Byrne’s outstanding contribution to Catholic education in Queensland recognised publicly,” Queensland Catholic Education Commission executive director Dr Lee-Anne Perry said. “His whole career has been dedicated to Catholic schooling as a teacher, a principal and an administrator. “Mike has an incredible depth of knowledge and experience that he has always been willing to share with others. Rowland chairman Geoff Rodgers was awarded a Medal of the Order of Australia in the General Division. Mr Rodgers has a 30-year track record in business, and has made a significant contribution to charitable and community organisations in Brisbane and Queensland. “His capacity for people is enormous, whether it be advising some of Australia’s largest companies on communication strategy, mentoring junior staff members, raising nearly $50,000 in his sixth year participating in the Vinnies CEO Sleepout, or managing his son’s cricket team,” Rowland managing director Helen Besly said. Rowland is one of Australia’s largest independent communication consultancies. “Having worked with Geoff for over two decades, and witnessing every day his boundless energy, relentless drive and a genuine passion for people, I could not be more proud of Geoff for receiving this award,” she said. Also honoured with an OAM was Concetta Mazzocato for service to the community of New Farm. “It’s wonderful that she has been honoured in this way for her contribution to the parish of New Farm and for her work with the Red Cross,” Catholic Women’s League of Queensland president Veronica Box said. Also on the OAM list was 98-year-old Lionel Veale, honoured for his service to the Gold Coast community. He was president of the Gold Coast Regional Council St Vincent de Paul Society from 1970-75. He served the St Vincent de Paul Society for 35 years, helping the poor and homeless and developing an aged-care facility. Mr Veale had a distinguished military service during the Second World War including operating as a coastwatcher behind enemy Japanese lines in the Pacific. He authored the book Wewak Mission. He is a parishioner at Mary Immaculate Parish at Ashmore and sings in the choir. Agata (Tina) Patane, a member of the St John’s Catholic Church in Silkwood was honoured with an OAM for her service to the performing arts, and the community. Australian Catholic University philosopher Associate Professor Bernadette Tobin and educator Dr Kevin Donnelly were also recognised in the honours list. Associate Professor Tobin has been named an Officer of the Order of Australia for her distinguished service to education and philosophy and to the development of bioethics in Australia as an academic. She has also been recognised as a leader on a range of public health advisory and research councils. Dr Donnelly has been made a member (AM) in the General Division of the Order of Australia for significant service to education as a researcher and author, to national curriculum development and to professional organisations. Jesuit Brother John May, from Sevenhill, South Australia, for significant service to winemaking, through contributions to professional associations, to regional tourism and to the Catholic Church in Australia. Presentation Sister Cecilia Mary Wiltshire, from Homebush West, NSW, for significant service to the community through social welfare programs, to education and to the Catholic Church in Australia. Fr Neville Drinkwater, from Charnwood, ACT, for his dedicated service to the Catholic Church in Australia.